People with mental health-related disabilities experience more repeat violence, more violence at the hands of someone they know, and live with more known risk factors for violent victimization than the general population. Findings from the General Social Survey (GSS 2014) on Canadians' Safety (Victimization) show that 1 in 10 people aged 15 and older with a disability related to mental health experienced violence in the preceding 12 months—more than double the proportion among all Canadians (4%). According to the Canadian Survey on Disability (2012), an estimated one million Canadians live with a mental health-related disability. These are defined as emotional, psychological or mental health conditions—including anxiety, depression, bipolar disorder, anorexia, substance abuse and others—which sometimes, often, or always limit daily life. The Juristat article "Violent victimization of Canadians with mental health-related disabilities, 2014" looks at the experiences of Canadians with mental health-related disabilities with respect to violent victimization, interactions with police and use of victims' services. Additionally, this article explores how people with mental health-related disability live with other known risk factors for violent victimization, which compound the vulnerability faced by this population. People living with a disability related to mental health were more likely to have experienced each of the types of violent victimization measured by the GSS—sexual assault, physical assault and robbery—in the 12 months preceding the survey. Women with disabilities related to mental health were especially likely to experience violence. The proportion of women with mental health-related disabilities who reported being a victim of sexual assault (7%) was over three times higher than that of their counterparts with no such condition (2%). The relationship between victimization and disabilities related to mental health is complex. While research has suggested that some individuals with mental health-related disabilities may be more susceptible to victimization, other studies have shown that the trauma of victimization can be the catalyst for mental health disabilities or can worsen existing conditions. Experiences of repeat victimization, which can compound victimization's negative effects, were reported by 30% of people with mental health-related disabilities who had been victimized. This compared with 17% of those with no such condition. Spousal violence—that is, violence committed by a current or former spouse or common-law partner—was four times more common among those with a mental health-related disability. When the violence was committed by someone other than a spouse, the perpetrator of violence against a person with a mental health-related disability was most often a family member, friend or someone else the victim knew (60% of violent incidents). In comparison, those with no such condition experienced violence by strangers in about half of incidents. See the chart "Incidents of self-reported violent victimization in the past 12 months, by relationship of offender to victim and victim's mental health disability status, Canada, 2014." Those with mental health-related disabilities often reported other well-established risk factors for violent victimization, including physical or sexual abuse in childhood (51%). A history of homelessness—another factor consistently linked to victimization—was also more common among those with a mental health-related disability (23%). Additionally, people with mental health-related disabilities often lived with other forms of disability (63%), and reported recent substance use including binge drinking (44%) and drug use or dependence (15%). All of these have been linked to an increased risk of experiencing violence. While a number of adverse life experiences were more common for those with a mental health-related disability, those who became victims of violence were also more likely to develop severe psychological symptoms as a result of their victimization. Victims with a disability related to mental health more often reported having experienced psychological symptoms consistent with post-traumatic stress disorder (29%) as a result of their victimization (versus 11% of victims with no mental health-related disability). Self-reported victimization data show that violent crimes, including sexual assault, physical assault and robbery, often go unreported to the police. Police involvement was especially unlikely when the victim had a mental health-related disability. Less than a quarter of the incidents experienced by this group had been reported, compared with 31% among victims with no mental health-related disability. The overall perceptions of police held by people with mental health-related disabilities—regardless of whether or not they had been victims of violence—were generally less favourable than those held by people with no such condition. For example, they were less likely to say that they considered the police to be approachable and easy to talk to (56% versus 67%) and less likely to think the police treat people fairly (52% versus 63%). 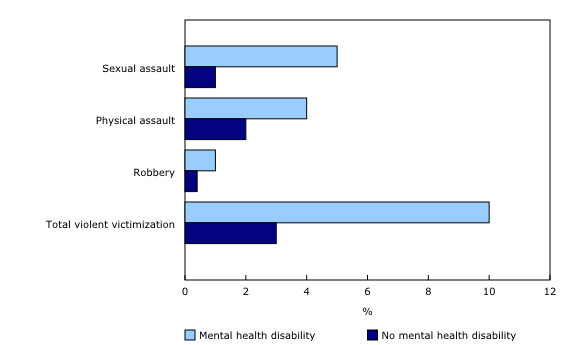 The 2014 General Social Survey (GSS) on Canadians' Safety (Victimization) identified persons with a mental health-related disability using the Disability Screening Questions module, which classifies a respondent as having this kind of disability if their daily activities are sometimes, often, or always limited by difficulties related to mental or psychological health. Previous cycles of the GSS used a different set of questions to identify persons with a disability. As such, data on persons with a mental health-related disability cannot be compared between the 2014 cycle and that of previous cycles. Further, the definition of mental health-related disability used here does not include learning disabilities or disabilities related to memory. It is important to note that cross-sectional data, such as those collected by the 2014 GSS, cannot show whether mental health disability precedes victimization or is a consequence thereof. The target population of the 2014 GSS consisted of people aged 15 years and older in the provinces and territories, and excluded people living full-time in institutions, such as prisons, residential care facilities, shelters and other collective dwellings from its sampling frame. This means that findings presented here may not be representative of all Canadians with mental health-related disabilities. Additionally, data exclude individuals with a disability related to mental health which had lasted less than six months, and those who indicated that their conditions were managed through treatment to the degree that they no longer interfered with their daily lives. Unless otherwise noted, statistics on violent victimization exclude experiences of spousal violence, which are collected through a separate methodology from statistics on non-spousal violence. Spousal violence statistics are calculated based on respondents who were married or living in common-law relationships, or who were separated or divorced, but had had contact with their former partner during the previous five years. 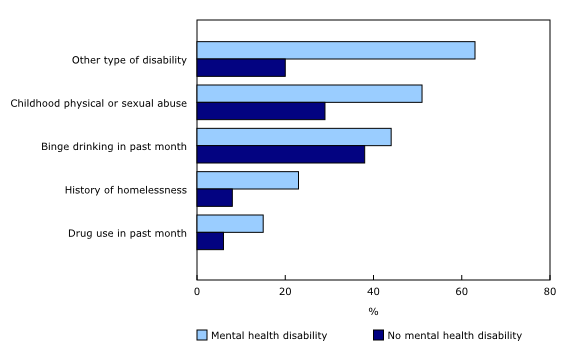 Statistics on the prevalence of mental health-related disability presented in this paper are based on the 2012 Canadian Survey on Disability (CSD). Updated data from the 2017 CSD will be released in late November 2018. The article "Violent victimization of Canadians with mental health-related disabilities, 2014" is now available as part of the publication Juristat (Catalogue number85-002-X).